SAP-Bangladesh has a General Body to exercise supreme authority in running the organization. The General Body comprise of 15 (fifteen) members from among the civil society members, development activists and entrepreneurs of the organization of which at least one third will be female members. The affairs of the organization are managed by a Board of Directors consist of 9 (nine) members including at least 2 (two) female members. The general body members of the organization elect the Board of Directors in the annual general meeting from among the general body members. 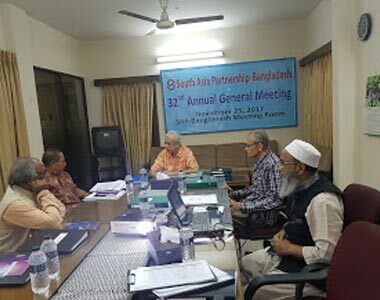 The Board meets quarterly to provide strategic decisions and policy support in the operation of SAP-Bangladesh. The day to day management and execution of policies and programs of the organization is vested in the Executive Director. He is authorized to sign agreement with any party for the purpose of official business including project related funding agreement with donors, loan agreement with banks and other non-banking financial institutions for taking loan, lease agreement, etc. The Executive Director is responsible to the Board of Directors for all his/her actions. In case of resignation, separation and death of the Executive Director, the Board of Directors will initiate action as required.